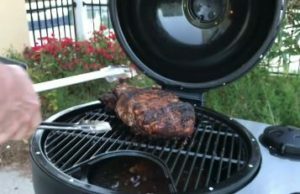 I was surprised to read such a positive review for a Charbroil product. They usually do not inspire confidence in regards to longevity and effectiveness but you have convinced me to consider it when I finally replace my old smokey mountain. It sounds like it is fairly well insulated too which I considered to be a big plus for the ceramic cookers. Since I didn’t want to spend a fortune on my first entry into a Kamado style cooker I decided to give the Kamander a try. Assembly was a breeze and didn’t really take that much time. I just laid out all the parts and followed the directions. It does help to have someone give you a hand in a few places. This issue with the grill as it stands is the use of bad fitting plastic parts for the air intake. Air control is key to proper Kamado style cooker and this is where this product falls way short of hitting the mark. On mine the plastic duct work that goes from the control in the top to the bottom of the grill leaked so much air that it was impossible to control the heat. I ended up having to fabricate a set of gaskets to seal it all up. Once that was done it worked great. But it won’t last, if you only cook low and slow then it may survive but if you like to search up some steaks it will get far to hit and deform the plastic and then it just runs away from you. If all you want to do is grill burgers, steaks and meats then it may not be an issue for you. However, if you want to cook low and slow and do some smoked meats then this will not work as it should. If they get rid of the cheap plastic in this key area then they will have a fine product but for now this one is a serious miss. There are better options out there for low cost Kamado grills and I would recommend you get that one instead. Thanks for that update Mark!